Jovana Stanisljevic is assistant professor in the Department of People, Organization, Society in Grenoble Ecole de Management (GEM) in France. She teaches several courses in the domain of international business including Managerial Economics, Global Trade Relations, International Trade, Business Development in Emerging Economies, International Negotiation & Sales Techniques, Managing Cultural Diversity. 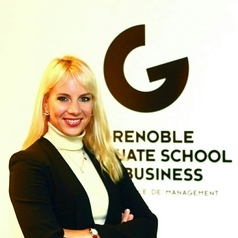 She is also a Program Director of Msc Marketing Management program of GEM that runs in Grenoble and Berlin.